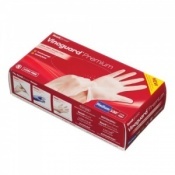 Readigloves Nytraguard Bluple Nitrile Gloves are an example of the very latest innovation for high performance in protective hand care for medical and healthcare industries. These lightweight, high comfort gloves allow the wearer to handle tasks with great sensitivity and dexterity as well as being durable and tough against rips and punctures. The Readigloves Nytraguard Bluple Nitrile Gloves are perfect for the majority of tasks in a healthcare setting but can also be used for a huge variety of general tasks requiring hand protection, for example food handling or use for hairdressers. These gloves have been left un-powdered to eliminate skin irritation or contamination. The Readigloves Nytraguard Bluple Gloves are nitrile gloves and are made with synthetic materials rather than natural latex. The main material is called acrylonitrile butadiene. 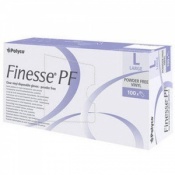 This product does not contain latex or styrene and are powder free, making them ideal for people that suffer from a latex allergy and for preventing contamination. These gloves are designed with the user in mind and are created to be strong, easy donning and tactile. The gloves are sold in boxes of 100 or 200 gloves and are ambidextrous. The fingers of each glove have a textured surface to increase dexterity, grip and touch sensitivity. The Bluple Gloves should be stored in the box given and away from direct sunlight. The gloves should last up to 3 years in their box. Each glove is designed to be a single use item (Non sterile class 1 Medical Device). These Nytraguard Bluple Gloves offer excellent protection and durability. The more durable the glove the longer it lasts and the less gloves you get through. In a clinical setting this protection is of highest importance, is not just for the clinician but also to prevent cross infection to the patient. The advanced material of Bluple Gloves, coupled with state of the art manufacturing plants and regular production quality checks in factory based laboratories, ensures that Bluple is produced without microscopic holes that would otherwise lead to viral penetration and tearing. For more in the readigloves range visit SafetyGloves.co.uk or for more information on the range call our customer help desk. I work in a cafe with two griddles and two fryers the nitrile gloves allow me to handle hot food and avoid fat splashes. I treat them like a second skin and wash my hands like I normally would whilst wearing them. They last a good two hours before disintegrating and they dont melt like vinyl gloves or rot with oil like latex.